All transactions are safe and secure with a reliable history in online purchasing behind each of our associates. Buy the Moe's Tavern Simpsons t-shirt to own Simpsons clothing and merchandise. Click through to browse Moe's Tavern apparel, including the Moe's Tavern t-shirt shown on the left. Each piece of Moe's Tavern Simpsons merchandise features this unique Moe's Tavern logo. 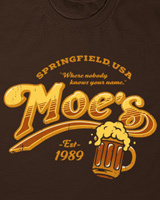 The entire design reads, "Moe's, Where Nobody Knows Your Name." This Simpsons t-shirt works great with the Duff Beer Simpsons hat. Wear it to let everyone know that Moe's Tavern is your establishment of choice. In addition to the Moe's Tavern Simpsons tee above, browse the Simpsons Clothing Gallery for more apparel like men's and women's clothes, kids shirts or hoodies.